"Due to the amount of food it can hold, the reasonable price, the quality of construction, and the rave reviews...the best feeder available today." "Inexpensive and designed for common pet shenanigans." "Allows you to load up the food wheel with six pre-portioned meals and then have them delivered at whatever point you want to." "It can do a little bit of everything." "What sets this feeder apart is the number of meals that can be programmed." "Allows you to control your cat’s food intake via your smartphone." "Short and wide, this rounded feeder fits well under tables or in small areas." "If you need a pet feeder that can hold a lot of pet food, this is the way to go." While all automatic cat feeders essentially accomplish the same goal of worry-free feline food dispensing, not all do it in the same way. 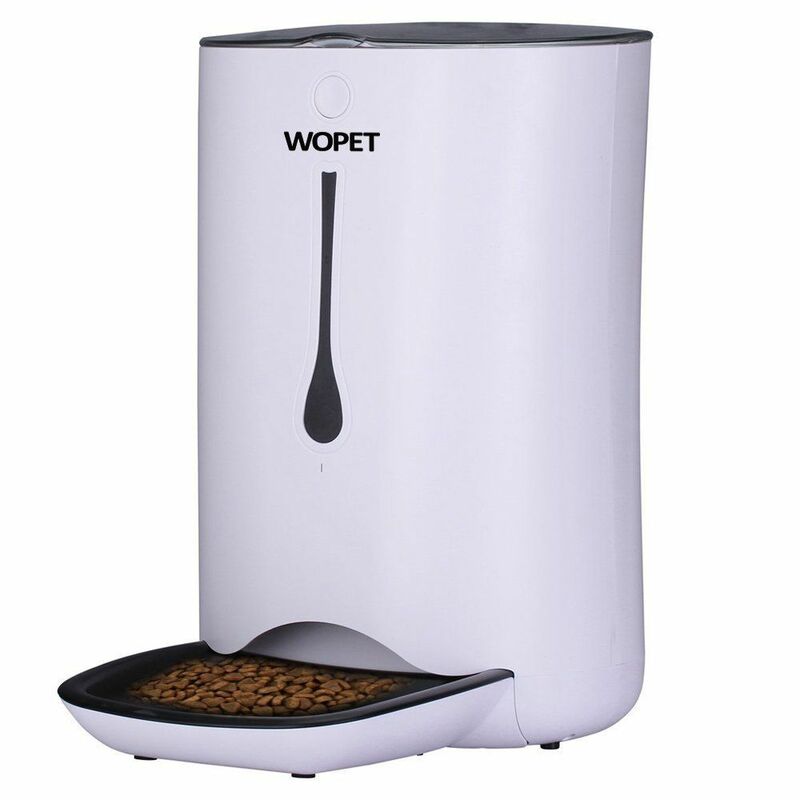 Due to the amount of food it can hold, the reasonable price, the quality of construction, and the rave reviews from many customers, the WOpet 7L Automatic Pet Feeder sticks out among the competition as the best feeder available today. The sleek feeder is composed of a hopper that stores the food and a small dish at the bottom for easy eating, even with small cats. The container has an easy locking lid so that your beloved pet won’t get in and overeat. With the WOpet automatic feeder, you can schedule up to four feedings per day—great for one cat or two. Setting the feeding schedule is simple with the LCD display screen and intuitive timer system. This small appliance uses wall power and features a D-cell battery backup to ensure regular feeding even in a storm. The WOpet automatic feeder is ideal for portion control as it lets you set the precise amount of food being dished out with each meal, ranging from two teaspoons to 4.5 cups at a time. The 7-liter storage container holds about 20 cups of dry food. This automatic feeder is beloved by customers and allows pet parents to record a voice message to play during mealtime. If you want to ensure your fluffy friend is fed during a vacation or trip, you don’t need a high-tech appliance to be confident there’s enough food. Rather, you can opt for the inexpensive low-tech gravity feeder. 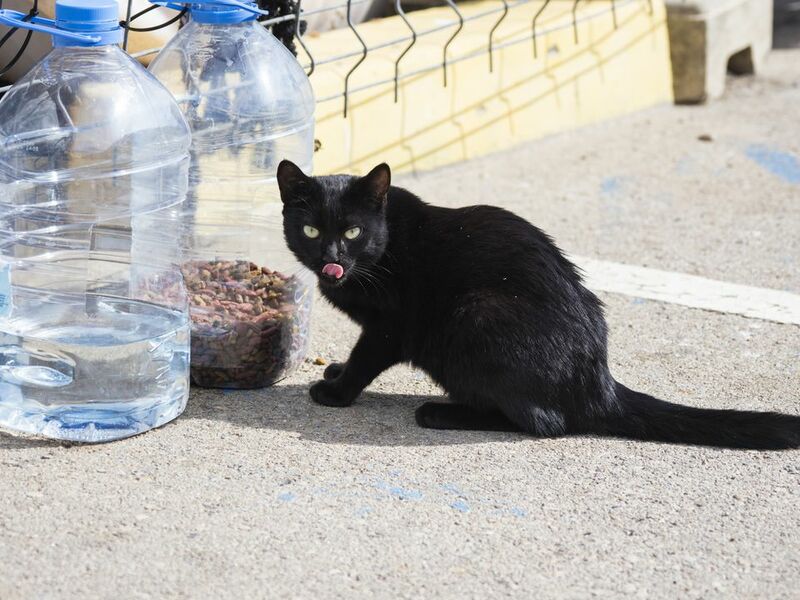 Blessed Family sells a low-cost water and food dispenser that both use gravity, which is perfect for both cats and dogs. The Blessed Family Cat and Dog Feeder set includes two similar devices. The water feeder has a 3.8-liter storage tank of water released into a small bowl consistently. The water feeder uses gravity, a spiral track, and spring-loaded valve to deliver constant water but prevent overflow. Additionally, Blessed Family has a gravity-powered food feeder that drops dry food from a 3.8-liter storage area into a small bowl at a consistent rate as your cat eats it up. The entire feeding system is inexpensive and designed for common pet shenanigans. For example, the base has non-slip rubber to limit the inevitable slips and spills. The feeders are made of food-safe plastic. The PetSafe Six Meal Automatic Pet Feeder is the perfect option for daily feeding with one or multiple cats. Unlike many other automatic feeders where you pour all of the food into a storage tank and then have it doled out using the system, the PetSafe Six Meal feeder allows you to load up the food wheel with six pre-portioned meals and then have them delivered at whatever point you want to. You can spread the six out over two days or feed two cats at different times through the workday. To use the PetSafe Six Meal feeder, simply open the pet-safe lid and load up the number of portions you want. Set the feeding times on the easy-to-use LCD screen atop the feeder, and then you're done! You can go about your day and feel confident that your cat will get the food he or she needs. The small appliance runs on four D-cell batteries and can last up to nine months without a battery change. The food bowl can easily be removed for cleaning, which is a huge plus for pet owners. Reviewers also love that this feeder can handle semi-moist food, which many others cannot. If you're looking for a reliable daily feeder with convenient features, this is the way to go. The Homdox Automatic pet feeder has an eye-catching design, but it’s most impressive because it can do a little bit of everything. The astronaut-shaped machine delivers up to four precisely timed meals, which is perfect for busy pet parents. Additionally, there are 39 different portion options ranging from 5 grams of food to 195 grams with each serving. Users simply navigate the LCD screen at the front of the appliance to schedule the exact feeding schedule their cat needs. This versatile feeder also allows people to record their voices for a loving message to accompany a meal—a feature that is perfect for vacations. Additionally, the device can feed a cat for up to five days. The food storage container can hold 2.5 liters of food and is moisture resistant, ensuring your cat’s dry food stays that way. And, if you're worried about over-feeding, the Homdox feeder also features infrared detection for overfeeding by the bowl. If you're looking for a feeder for several cats, the PetSafe Healthy Pet Simply Feed Automatic Feeder is consistently well-reviewed and a popular option for pet parents. The small home appliance can hold up to 24 cups of food in the storage hopper and features a 5 cup eating bowl. What sets this feeder apart is the number of meals that can be programmed. Cat owners can program up to 12 meals with portion sizes ranging from 1/8 to 4 cups per serving. This is ideal for feeding multiple cats at precise times throughout the day, whether feeding together or separately. Additionally, this unique feeder has a slow release function that dishes out food over the course of 15 minutes to prevent overeating—perfect for two competitive cats. In addition to scheduling 12 timed meals, the PetSafe feeder also has a pet-resistant lid, a stainless steel bowl, and several dishwasher-safe parts. Pet owners can take advantage of the immediate feed mode for extra hungry cats or pause mode for cats that are slow to eat. The appliance runs on D-cell batteries, but a wall adapter can be used as well. Why program your automatic cat feeder when you can use an app? PetSafe’s Smart Feeder allows you to control your cat’s food intake via your smartphone. Ideal for frequent travelers, the Smart Feeder has both iPhone and Android apps to customize and control your pet feeding schedule. With the app you can set feeding times, adjust portion size, and receive updates about your cat’s eating habits. Although this device is “smart,” it will continue to feed your cat even if WiFi connection is lost. Aside from the app, the feeder is an excellent appliance. With a 24-cup storage capacity, it can hold food for days. You can program up to 12 meals at a time and the device comes with a stainless steel bowl. Even better, this model is made almost completely of dishwasher-safe items that can be easily cleaned. Shaped more like a cat toy or a Roomba than a feeder, the Qpets Automatic Feeder is a great choice for cat owners in apartments or smaller living spaces. Short and wide, this rounded feeder fits well under tables or in small areas of the home. Despite its small size, the Qpets feeder is just as effective at delivering your feline the food he or she needs to stay happy and healthy. Rather than dispensing food from a hopper into a bowl (like a larger feeder), this compact option lets users fill up to six sections of the food wheel and the automatic lid reveals one at a time for a simplified process. Each compartment holds up to one cup of food and allows for easy portion management. You can feed your cat six times a day and even add a voice message with each meal. The feeding times are programmed using the LCD timer on the side of the appliance. Although the lid moves to reveal food for your cat, it is a locking lid to prevent your cat or dog from breaking into the portions for later. If you need a pet feeder that can hold a lot of pet food, this is the way to go. This simple device, composed of a storage hopper, a food bowl, and a timing unit, can hold up to 10 pounds of pet food. Use the LCD display on the side of the feeder to set multiple feeding times throughout the day, and then pick the right portion size. You can schedule up to four feedings per day and set the schedule for multiple days. The Qpets AF 200 feeder can be powered with either a wall outlet or four D-cell batteries, which can last six months. This large feeder works for both small and large cats, and the bowl can be easily removed for cleaning. If you have any long trips coming up, this feeder will work well as a long-term feeding option for your furry friend.